She is SO adorable! I found this so interesting...how do you manage checking for food allergies? Did you introduce each non-pureed food one at a time? THank you! We did not. Our pediatrician was pretty chill about the whole one food at a time thing since we have no food allergies in either of our families. We will probably wait a while to introduce any high allergy foods like honey, nuts, etc.. but other than that, we've just been feeding her new things every day. 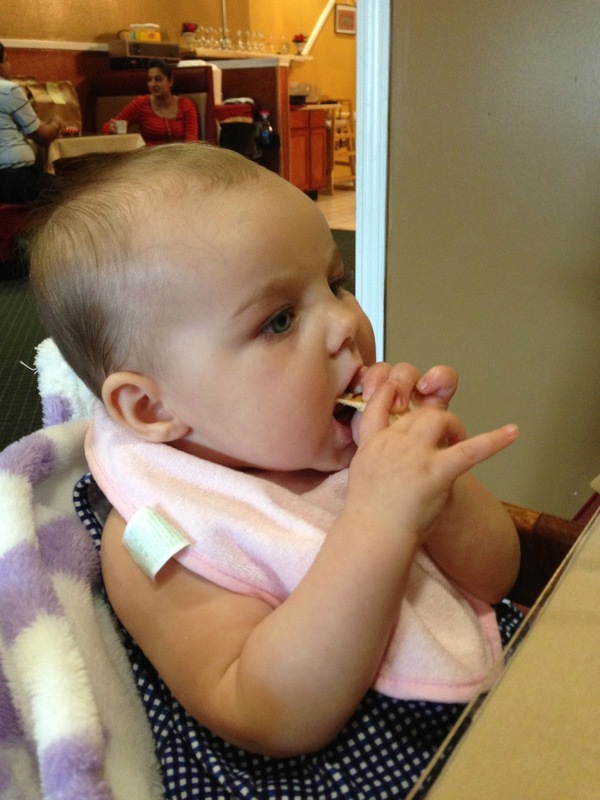 That is adorable - I love the how excited she gets for each mouthful! My little girl has just turned 6 months and we're taking a similar approach with a combo of puree and finger foods (although we started fruit and veg purees at about 4.5 months). We saw our doctor for 6 month immunisations today and they gave us a good resource link on some of the current research on foods that are potential allergens (Australian website but based on international research) - basically the current thinking is not to hold off on potential allergens, as there is no evidence it reduces allergy risk, and some that it may actually increase risk.